Do you still have the tooth? If so, rinse it carefully to remove any debris while leaving the natural tissue intact. Then, place it in the socket it came from and hold it in place until you are able to reach our office. If this is not possible, place the tooth in a cup or baggie of milk and bring it with you to your emergency appointment, where your dentist can determine if reattachment is a viable option. When experiencing the pain of traumatic injury, panic is a natural response. However, quick thinking and staying calm are the best ways to approach a toothache, or any common dental emergency, and to prevent additional or unnecessary damage and costly dental restoration. 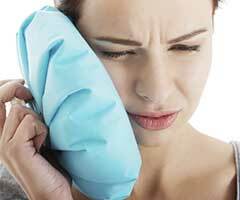 We suggest applying cold compresses to reduce swelling, and contacting an emergency dentist as soon as possible. Rinse your mouth and specifically the area around the hurting tooth as thoroughly as possible. Floss as well. We strongly recommend that you not place an aspirin on the tooth because this could burn the gum tissue. If you have taken these steps and the tooth is still painful, contact our office immediately. As a conservative dentist, Dr. Barsky always prefers to help patients retain their teeth or as much original tooth structure as possible. However, there are instances when a tooth simply cannot be saved. When this happens, Dr. Barsky and his team will perform a simple extraction under local anesthetic. And before the tooth is even extracted, we will talk to you about the appropriate restoration, so your smile remains complete. Dry the tooth and then apply a small amount of toothpaste, dental wax, or another safe temporary adhesive to the surface. Position the crown into its original place. Be sure to contact our emergency dentist so that we can arrange a time to professionally reattach the temporary crown as soon as possible. Rinse the damaged tooth with warm water. On your way to our office, a cold compress held to the appropriate cheek should be able to reduce any uncomfortable swelling. Are you in need of emergency help? Contact Aesthetic Dentistry of South Miami as soon as possible so we can bring you in for treatment. Dr. Barsky is dedicated to providing all of his valued patients with sophisticated, personalized services and high-quality results so that you are able to enjoy your smile to the fullest. We look forward to meeting you!